Sen. Tom Udall (D-NM)’s S.J. Res. 19, the constitutional amendment proposal that would severely handicap our First Amendment political speech protections, has just been pushed forward in the Senate. The Hill reports that early on Monday, the Senate advanced the amendment proposal after 20 Republicans voted with Democrats. The amendment, which would reverse the Supreme Court’s decision in Citizens United v. Federal Election Commission, has been worded to restrict the work performed by issue-focused nonprofit organizations and political action committees. It would also target corporations, which is the reason why this amendment is being so widely supported by liberals. While most Republicans originally stood against boosting the regulatory burden on political speech, Sens. Marco Rubio (R-FL), John McCain (R-AZ), and Lindsey Graham (R-SC) - among others - voted to push the motion forward. Sen. Rand Paul (R-KY), among others, voted against the proposal. While the House has spent the summer ensuring the bills funding the government for the new fiscal year are passed, Senate members have been reluctant to go over the specifics. The difference between passing several bills and one major bill, Massie explained, is that a continuing resolution will be their last shot at keeping the government functioning once they run out of time, putting the decision in the hands of four people, instead of the whole congressional body. It’s never too late to wage a war on something you deem terrifying – if you’re the government. A recent report has highlighted the obvious: Washington has no idea of what to do with all the easy taxpayer cash it has access to. It’s almost as if bureaucrats aren’t good at spending your money wisely! According to The Week, the federal government is using a grant offered to the National Science Foundation to target memes. 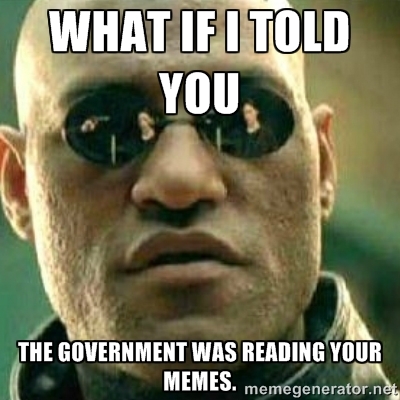 That’s right; Washington has used about $1 million of your money to finance a database of memes they deem suspicious. Officials, following instructions that tell them to single out any “suspicious memes” or any “false and misleading” political ideas that may have turned into memes, hunt for these images by browsing through social media websites. The Indiana University is the official headquarters for the special “war on memes” department. The official title of the program is “Truthy.” It’s reportedly inspired on Stephen Colbert’s “truthiness” concept. And what do officials do while browsing for potentially life-threatening memes? They look for the origin of the memes so they may identify the source as a professional political activist or just a good old Internet user like you, for an instance. While the program seems harmless enough on the surface, one million dollars thrown at an effort to catalog memes and identify their sources so that the federal government can put up a web service offering the public info on suspicious meme trends seems eerily close to what a thought police would look like. Or am I just seeing things here? Before Catherine Ann Novelli, Apple’s VP for “global government affairs,” was nominated as the Obama administration’s under secretary for economic growth, energy, and the environment, Congress used the excuse Apple moved money around to reduce its owed taxes while simply following the tax code to grill its CEO Tim Cook. Politicians who were angry Apple didn’t use its influence to gain some leverage with lawmakers by creating political action committees used this official investigation to serve as a way to teach Apple - and other companies - just how they must proceed to be allowed to play the game. The message was clear: either ramp up your lobbying and spend more of your hard-earned money on political campaign efforts, or be prepared for a major Beltway shakedown. Unlike Apple, Uber - the transportation company that was recently under the spotlight for being threatened by the Taxi cartel - did not wait until a shakedown was put in place to act; the company has recently hired President Obama’s former campaign manager and White House adviser David Plouffe as a senior vice president of policy and strategy. What does that mean? That his influence in Washington will help assure Uber’s strong ties with government are in place, helping sustain the company’s dominance over the industry. The recent stories coming from Ferguson, Missouri have stirred the police militarization debate by putting the spotlight on the police’s use of “surplus” war gear to contain a mass of protestors in the suburbs of St. Louis. The protests followed the killing of Michael Brown, and while most are peaceful, local police — and now the National Guard — have proceeded to use rubber bullets, tear gas and other aggressive methods such as curfews to fight locals and even journalists covering the events. Without proper coverage, it’s nearly impossible to know what is truly going on in Ferguson, especially because the Federal Aviation Administration banned helicopters to fly below 3,000 feet over the region as soon as the unrest began. News crews often use helicopters to cover live events, but with the ban, law enforcement agents on the ground have a free pass to act according to their understanding of the situation. One essential piece of this equation, however, is missing from the public debate; lawmakers who support the government’s program allowing the distribution of leftover war gear and weapons to local police departments are also the same lawmakers who receive a considerable amount of financial support from defense contractors. A book on Sgt. Bowe Bergdahl and his story could soon become a reality, but not without the participation of his six former platoon mates, which is making some publishers nervous; neither of the former mates have any positive words to share on who they call a “premeditated” deserter. Publishers have shown hesitation over what they have read so far from a draft of the book proposal. According to the agents representing the six former platoon mates, the book would play right into what conservatives have been using to criticize President Obama’s handling of Bergdahl’s rescue, which required a prisoner exchange that saw the release of five terrorism suspects who had been held in Guantanamo until the swap took place. Some of the prisoners the Taliban requested in exchange for Bergdahl were reportedly considered senior Taliban commanders. At least one of the prisoners had been allegedly linked to the mass killing of Shiite Muslims in Afghanistan between 2000 and 2001. Export-Import Bank officials have been playing lobbyists not only to U.S. lawmakers, but also to business owners. According to Washington Examiner’s Tim Carney, serving a dual purpose is far from cheap to the taxpayers sustaining the agency. The travels may seem of little importance to supporters of the Ex-Im Bank, but the problem lies elsewhere; during 2012, for an instance, Ex-Im spent $2.7 million in travel expenses while budgeting $1.7 million. During the next fiscal year, the agency budgeted $1.2 million and spent $2.2 million, but the year of 2014 has been just as concerning. According to The Hill, Ex-Im budgeted $1.3 million, but has already estimated that the total spending may reach the $2.3 million mark. Officials attempting to boost the public support of the bank and encourage businesses to lobby for subsidies are the ones doing most of the traveling, which is essentially creating a vicious cycle. When it comes to President Obama and special interests, hypocrisy is what automatically comes to mind. The candidate who once promised the country he would fight special interests in Washington hasn’t kept his word as president, and is now once again showing no signs of change. After lobbyists appealed a federal court’s decision to dismiss a lawsuit against the administration over banning registered lobbyists from serving on federal advisory boards, the White House’s Office of Management and Budget has released a new guidance making it possible for registered lobbyists to serve on advisory boards again while representing a client. In spite of the so-called ban, which was placed in 2010, former lobbyists were never banned from serving. In many cases former lobbyists served on advisory boards without the need of receiving special waivers, which is the loophole they often explored to go around the 2010 ban. Candidate Obama’s ethics plan indicated where he once stood on special interests, at least on paper.